If you like Rob Snell's "Magic Edit" button (discussed in our Yahoo Store Tips & Tricks book) you will love our "Rapid Edit" add-on! 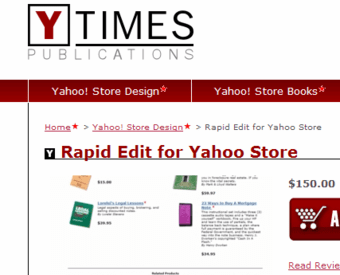 When you work on your Yahoo Store in the Store Editor, each time you want to edit a page, you first need to navigate to that page by using the WYSIWYG interface. So typically you click on one of your main menu options, then click on a section page link, then a sub-section, etc., until you get to the page you want to edit. Once the page is fully loaded, you can finally click on the Edit button to edit the page. How about if you could save a bunch of clicks by having to click a "special" edit button next to any link and it would open up that page's edit form? Our "Rapid Edit" does just that! This little tool will save you hours and hours! 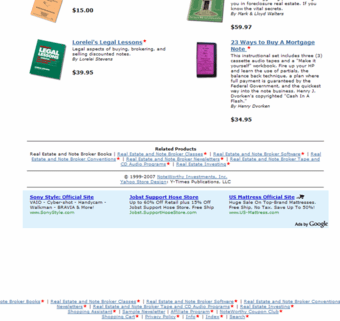 We install this very useful template in your store. Once installed, while in the editor (and of course not in your published site) a small red asterisk will show next to all the links that lead to other pages within your store. If you click that asterisk, the edit form of the target page will open, so you can make changes without having to actually go to that page first. Rapid Edit really delivers. I'm editing in half the time and with half the frustration of waiting for pages to load. If you're looking for editing short-cuts, you'll love rapid edit!! Always the best to deal with. The most knowledgeable about RTML and Yahoo store design. Their sites convert well. It took me some time to start using the "Little Red Stars" regularly -- I would forget about them being there. After a couple of weeks I began using them more and more often. Now it would be really difficult to work without them. It's amazing how something so simple can save so much time! Not only do they save you a mouse click, they allow you to jump straight to the target edit screen, so you only have to wait on one page to load instead of two (item page and "edit" page). On slower internet connections, this adds up fast! I highly recommend this add-on to anyone regularly working in Yahoo! Store Editor. This tool is a real time-saver. Anybody with a Yahoo! Store knows about the wait time required to get into your individual page editors - No more! 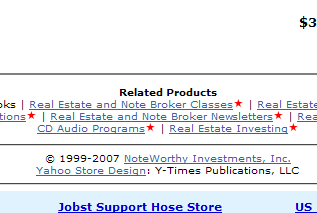 Just enter the store editor, click on the red star of the page you want to edit and BAM - Edit page! Thank You once again, Istvan. The rapid edit button worked perfectly and saved us time from the day it was installed onto our site. When we decided to add this feature I knew it would be a time saver but I didn't realize how much time. If you have a lot of products and need to make frequent updates to your pages, this is a great product for you. The rapid edit feature is a HUGE time saver for us, it worked as we expected right from the start with NO glitches. With a red star denoting editable pages, we are able to instinctively click through on the red star to edit pages directly without having to take time to find the item number or page id for those items, or waste time going to the item page in order to click on the edit button. Also, we used to always click through to "hard coded" pages in our site which took us out of the editor and into our live site, and that frequent waste of time has been eliminated with the reassuring red star. Thank you Istvan, for offering this excellent improvement. You are always helpful and we will certainly continue to work with you in the future. Since implementing the Rapid Edit feature on our site, we've become much more efficient. The Rapid Edit feature allows us to skip a step and jump straight to the edit screen, which we're thankful for this hectic holiday season! Good stuff.